Energy: Global energy demand is at an unsustainable rate. At this rate, the world will lock itself in an insecure, inefficient, and high-carbon energy system. Thus, innovations are needed to produce energy without consumption of non-renewable energy source. Free volt technology can be a solution to such a problem. Clean water is a scarce or unaffordable resource for people in developing countries. Further, natural disasters or man-made crises such as war place millions of people in new refugee camps that lack infrastructure to provide water to all of the residents. Purelives is a 5 gallon water filtration and transportation system allowing it to be used at home or at a water source and carried back to the home. Filter lasts for 3000-5000 gallons and stops allowing water through when it needs to be changed so there is no risk of using filters that are no longer appropriately cleaning water. Rebrand the company and product. “Portapure” reminds readers of sanitation (portapotties) and Pure Life is a name for a number of organizations (some religious) that focuses on sexual issues. Partner with NGOs to pilot the usage and understand real world challenges for using the system- how do you supply replacement filters, etc? Develop a pricing model that can meet low income people in developing countries, for example, microfinance leveraging community peer groups to ensure repayment. Can high-tech photosynthesis turn CO2 into fuel for your car? 1) The problem is crude oil dependence. Article title – Can high-tech photosynthesis turn CO2 into fuel for your car? What the technology does – The technology is artificial photosynthesis where solar energy is used to split water and carbon dioxide into hydrogen, oxygen and carbon. A catalyst then recombines the molecules to create liquid fuels, such as methanol. Methanol is the simplest hydrocarbon that works in internal combustion engines. Step 1 – Develop public-private partnerships to perform research on the developing technology. Step 2 – Determine viable options to fund and/or finance research. Step 3 – Once a team and funding is in place, determine a timeline for a pilot product to be complete. Primary category is Mobility, but application also touches Public Administration & Services, and Health & Safety. Perspective is city mayor’s office. 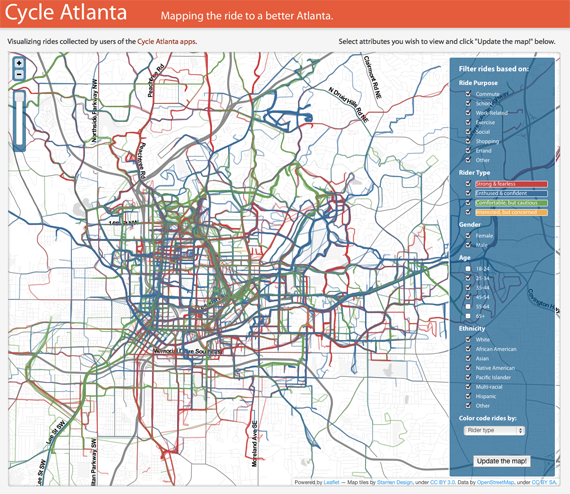 Big data (Cycle Atlanta) to anticipate development in civic engagement, not just remedy break-downs. 1) Many app services are reflexive and passive neither allowing the individual nor the project to achieve full realization, whereas Cycle Atlanta makes normative claims of what is happening and what is needed proactively. 2) “The Right Way to Make Cities Smart” Cycle Atlanta. Enables cyclists to record their ride data—where they’ve gone, why they went there, what kind of cyclist they are—in an effort to collect more knowledge about cycling in the city. Aggregates information with the explicit goal of helping the Atlanta cycling community advocate for particular infrastructural reforms. Collects data to inform planners where bike facilities should be built. 3) Stakeholders include tax payers, city planning, IT data servers, bicycle riders, city parks, private construction contractors, DOT, Business Improvement Districts. 4) Step 1) Hire tech company to install algorithms, servers, and start-up training to manage incoming date. Step 2) Establish boundaries of inclusion and exclusion for initial trial period. Step 3) Reach out to community boards in affected areas to discover their willingness to incorporate potential’s data’s findings. Step 4) Go live, and see what the users are actually experiencing! Power plants around the country use a centralized scheduling approach to forecast and distribute energy. This centralized approach does not support the integration of renewable energy systems and battery storage systems. The rise of on-site energy storage technologies makes centralized scheduling calculations significantly more complex. Researchers from North Carolina State University have developed a new technique for scheduling energy in electric grids that moves away from centralized management by tapping into the distributed computing power of energy devices. By having each device communicate with its immediate neighbors, the device can calculate and schedule how much energy it will need to store, how much to contribute to the network, and how much to draw from the network. In this way, the program can determine the optimal schedule for the entire grid. Distributed computing seeks to replace the traditional control center with a decentralized approach. This approach advances the smart grid concept by coordinating the energy being produced and stored by both conventional and renewable sources. The technology has been validated in simulations, and the researchers are in the process of implementing it in an experimental smart grid system at the National Science Foundation FREEDM Systems Center on NC State’s campus. They expect to have results in 2016.